Remember the other day when I said that seeing the finalized Fall roster was like Christmas? I was wrong. Today is like Christmas. It’s team picture day, also known as “Blogle scours players’ Twitter accounts for pictures of this year’s uniform to see if there were any significant changes” day. Try putting that on a t-shirt or flyer. Picture Day has brought us many surprises regarding uniforms in the past, let’s see what this year holds. 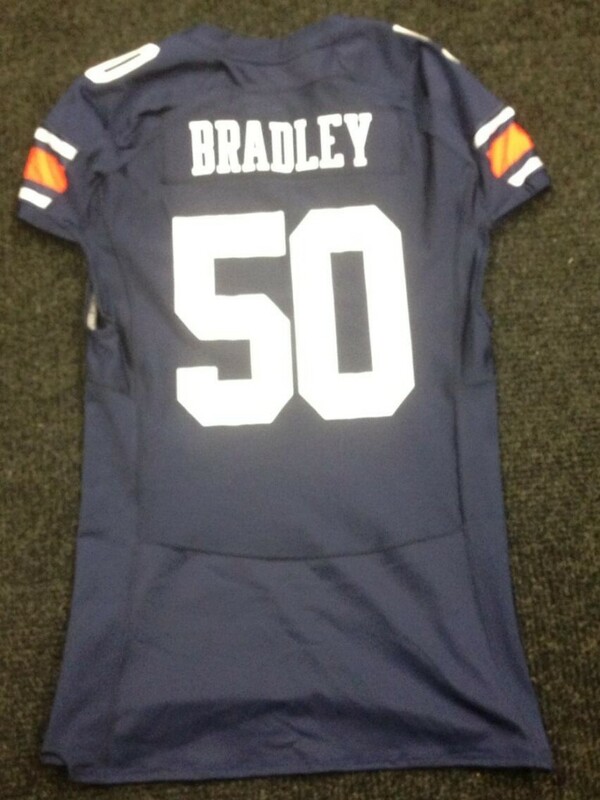 The day of uniform goodness began with SO DT Ben Bradley tweeting this picture of the back of his jersey. I don’t believe it will ever be untucked. If we’re looking for any changes to the back of the jersey, there are none. The teeny, tiny names from 2011 are still gone (changed last year), which is good, but the numbers are still nothing like 2010 and before. We need those names and numbers back to glory year size, stat. 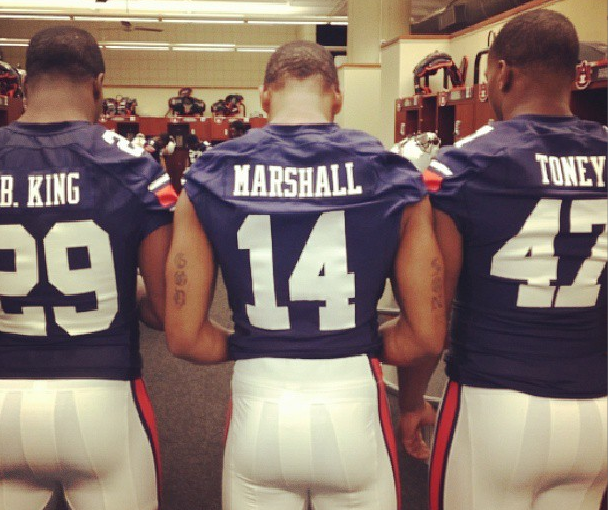 Later this morning, JR DB Brandon King posted this picture of FR LB Cameron Toney, JR QB Nick Marshall, and himself to his Instagram. Again, no changes on the jersey noticed, but wait…. where’s the ‘War Eagle’? You know, the one that’s graced the backsides of so many Tigers since 2011? From the view of Nick Marshall’s pants (and FR QR Dominic Walker’s), it’s gone. Meh, I didn’t love or hate it either way. But given that Auburn’s record with it was 11-14, I say it was time for the battle cry across the buttocks to go. 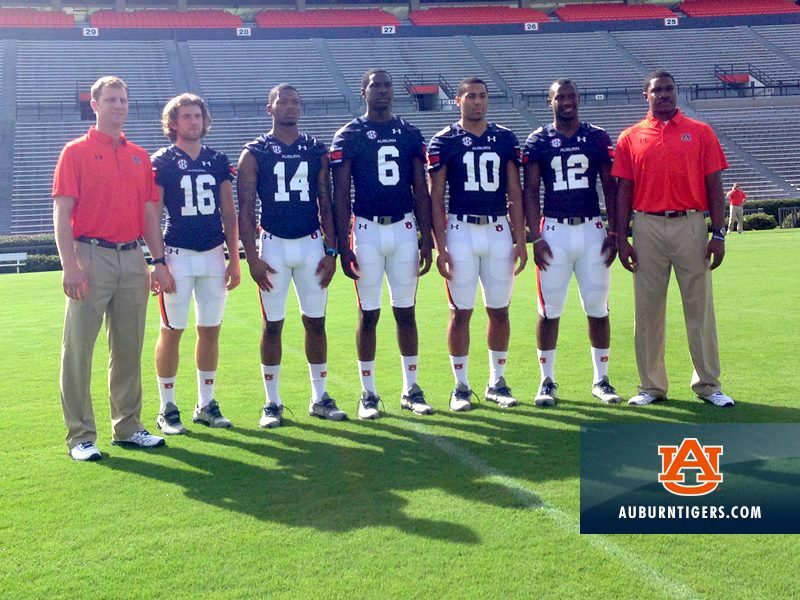 We finally get a nice front view of the uniform in this picture from Auburn Athletics. All I can say is yes, that is Tucker Tuberville, Jeremy Johnson is big, and I hate the new-ish rule change that allows players to have their pants pulled up above their knees. They are capri pants, not shorts. Oh, and you can see that the tapered pant stripe that we’ve had to deal with since 2011 is still there. One day Under Armour will make pants that allow a full stripe. I honestly wish Auburn went to these stripes, though. 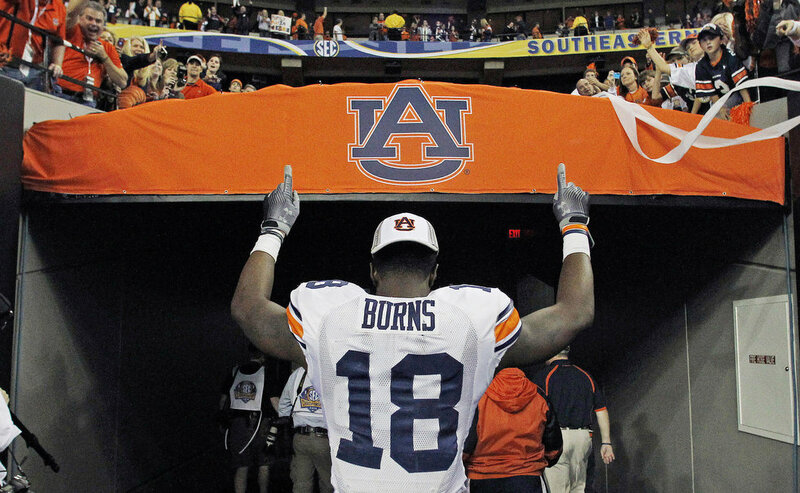 So other than the missing ‘War Eagle’ there is really nothing different from last year. Traditionalists will be happy, but as we’ve discussed many times before, this uniform isn’t really tradition. I’ll leave that discussion for a post next week that will truly divide the fan base like Jay Prosch busting through the Alabama defensive line. I’m a uniform nerd and I too loved the huge numbers we had in the past. And as you mentioned, I would like to see some changes with the striping. But I think it would be with the helmet. Just make them the same as the pants. That way, the colors would be in the same order, no matter what they’re on (Florida does this except for their orange jersey). I’d love to see us add either blue or orange pants to go with our away jersey but I’m beginning to think it will never happen.